In the fall of 2017, we announced that we were raising 100 million Euro to invest in early-stage tech startups from the Nordics and Baltics. Backed by an impressive Collective consisting of the founders behind successes like Skype, Kahoot, Zendesk, Unity, Tradeshift, Sitecore and Vivino, the ecosystems were excited. Having been through a challenging, exciting, at times gruelling and at the end very successful fundraising period, we can now proudly announce that we have managed to reach our goal of raising a EUR100 million fund. For a first-time fund, this is exceptional. See also TechCrunch from April 3rd: https://techcrunch.com/2019/04/02/byfounders/. Our portfolio companies are given unique access to deep industry and operational knowledge as well as an extensive network. When receiving an investment from byFounders, entrepreneurs are welcomed into a family of founders, and with it, easy access to competencies, advice and network crucial to the success of their companies. byFounders provides early-stage founders with unrivalled access to knowledge, expertise and insight from some of the most successful Nordic entrepreneurs. The support and operational guidance available from such a broad group is unique, and has the potential to play a major factor in the success of the next generation of startups from the region. Whether it's scaling, introductions, referrals, recruiting, global expansion or raising further funding rounds, our portfolio companies always find the advice they need in the 50-strong and growing Collective. When it comes to running a startup, everyone has an opinion, but all that really matters is being in the business and operating effectively. Every member of the Collective will have overcome the same challenges you face whether that’s hiring, entering new markets or product fit. Being able to tap into that knowledge is priceless! With offices in both Copenhagen and San Francisco, we serve as a springboard to the world for companies with global ambitions, whether they want to move to Silicon Valley or scale from the Nordics. byFounders has been instrumental in making introductions not just in Europe, but in the US as well. Until now, Nordic and Baltic startups have tended to relocate to the US once they’d reach a certain size, the primary reason being the lack of local funding sources. With the emergence of funds such as byFounders, the situation has changed. With the current level of accessibility of talent, capital and knowledge, there’s no reason you can’t now both build and grow a unicorn in every Nordic country. …in that sense byFounders is perfect for us. We think their project — a collective of the best Nordic founders investing in the next generation — is inspiring. The network provides a big value for us we couldn’t get elsewhere. We have great faith that byFounders will quickly become the most attractive fund in the region for this reason. Through the byFounders Collective we were introduced to Peter Hartzbech who really clicked with us and chose to invest. We love his vision for our company, and his unique network has opened a lot of doors for us. 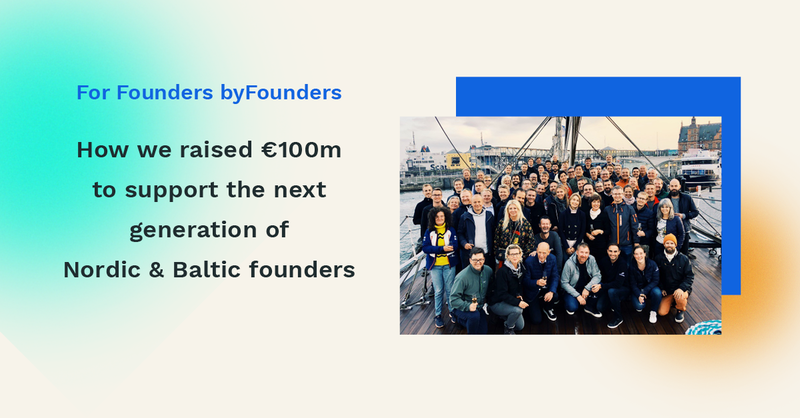 Alongside the byFounders Collective, we've reached our first-time fund size of EUR 100m by working closely with a powerful constellation of investors. Our single largest investor is the Danish Growth Fund, one of the most active fund of funds in the Nordics. Support from the likes of global funds like Isomer Capital, Draper Esprit and Digital Garage, as well as a number of prominent family offices from around the Nordics has also been instrumental. The partnership with byFounders is very important to us in Danske Bank. 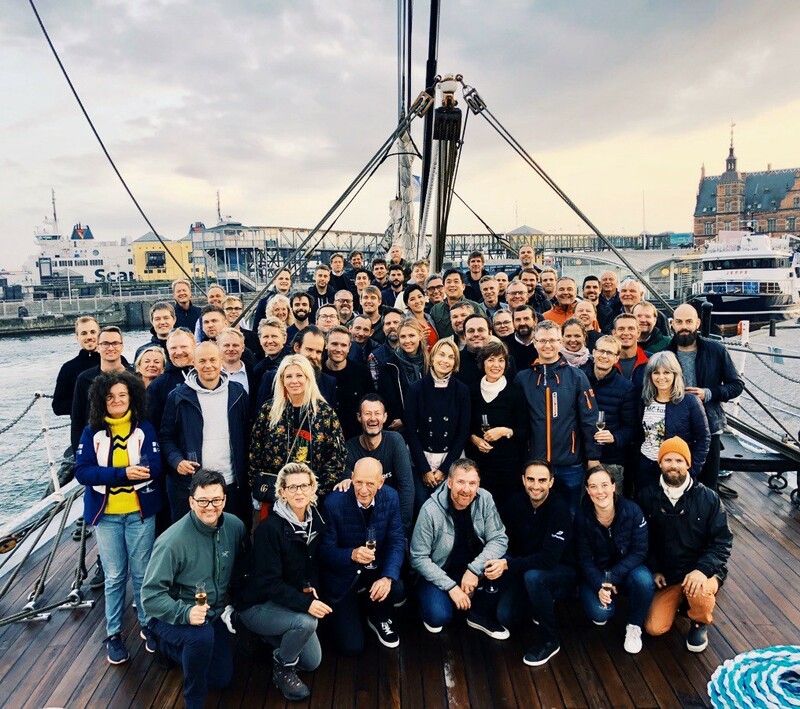 For one, we want to strengthen the Nordic startup scene, but we also want to gain a deeper understanding of how byFounders work as this represents a new strategic dimension to us. Frederik Vinten, head of Group Development at Danske Bank. byFounders was established on the firm belief that founders are well equipped to become excellent investors. We believe that having been in the entrepreneur’s shoes does makes a difference when providing critical support to early-stage founders. We chose byFounders because it is a true partnership. Because Eric and Tommy have already walked this path they want to hear your ‘gruesome truths’ so they can engage and help you resolve them. That has been very helpful in supporting us so far. Thanks to the increasingly mature and competent ecosystems, both the quantity and the quality of Nordic startups is higher than ever. Still, the road to success for an entrepreneur is not easy. Raising early-stage capital continues to be a challenge. Networking with the right people isn’t easy either. But the hardest part of all is getting the right help at the right time from the right people. I’m looking forward to helping the next generation of entrepreneurs find product-market fit and sharing what I’ve learned to help accelerate their journeys. byFounders Collective allows me to take part in shaping the founders of the future and highlighting the innovative and un-traditional companies that dare to think different and proves that the way to success doesn’t have to include a basement or a White Party. The philosophy underpinning byFounders is all about “paying it forward” to the ecosystems that fostered the Founders’ initial success. Smaller and weaker back then, the ecosystems now feature a rich set of knowledgeable and experienced people eager to give back. A necessary sign of a healthy and growing tech ecosystem is the increased amount of serial entrepreneurs who are able and willing to fund the next wave of world-conquering founders. byFounders is an excellent example of this starting to happen in the Nordics at an ever-increasing rate. I joined byFounders Collective because i believe that it is exactly what the local startup community needs. Paying it forward to support future founders and technology has always been important to me and I feel that the individuals and purpose behind byFounders are combining this with solid funding options in a very meaningful way. byFounders successfully closing their first fund is great for Nordic startups in general and Norwegian startups in particular. We at StartupLab are strong believers in that the Nordic region will continue to produce a disproportionately high number of successful startups, but in order for that to happen the region also needs more great funders. byFounders is a great addition to the Nordic ecosystem — their founder-friendly approach, wide network and high ambitions will without a doubt lead to more startup success stories from the region. With our first-time fund size of EUR100 million, we’re well-positioned to support the next generation of globally ambitious startups through several rounds, however, our sweet spot is seed stage companies. We always prioritize to bring additional investors or syndicates on board, so as to create strong platforms for our portfolio companies’ future capital rounds and growth.